This is the third in my series of posts about magical trees native to the Americas. In this series of posts, I explore the lore of sacred trees, describe their magical and mundane uses, edible qualities, medicinal qualities, and other assorted lore. While there are approximately 128 different species of maple, I’m going to focus my comments on one dominant maple in this region–the sugar maple (Acer saccharum) although some of the commentary here also applies to other kinds of maple trees. The sugar maple is a tree with which I have always had the strongest of affinities. The sugar maple grows through much of the Midwest and north eastern parts of the USA, and has been a dominant tree in the four states where I’ve lived–PA, NY, IN, and MI. In fact, the sugar maple is critically important to the health of forests throughout its range, often forming pairings with beech, birch, oak, and/or ash. A typical tree can grow up to 115 feet tall, although it is also quite shade tolerant and therefore functions as a great understory tree. Maples produce a vibrant display in the fall–and none better than the sugar maple. The sugar maple is sometimes called the “fire maple” because it produces brilliant red/orange/yellow leaves. I love watching them slowly change over a period of days until they are all fiery and beautiful! 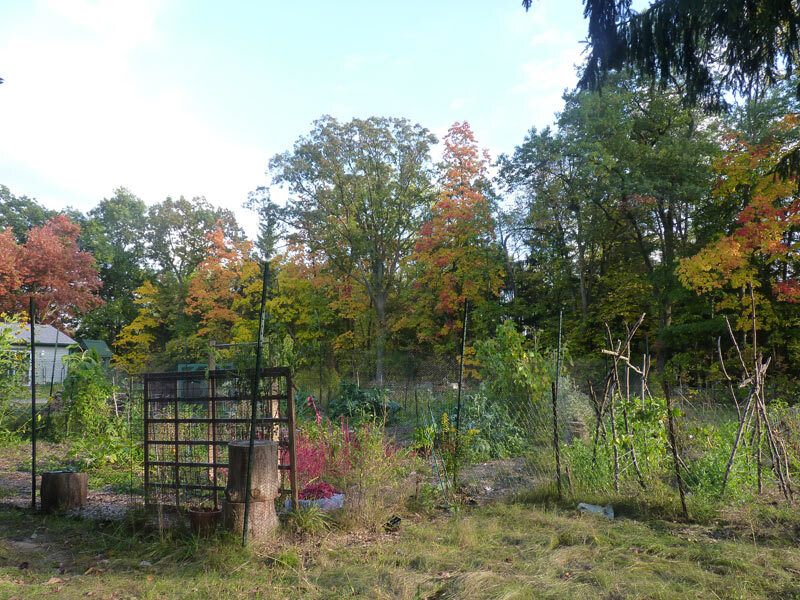 Scene from my garden with fall foliage in bloom! Maple trees are mostly red and yellow in this scene. Unfortunately, sugar maples have seen quite a bit of decline due to logging of forests (they are slow growing, and faster growing trees, like birch, will often come up in their places after a forest is logged). Sugar maples are also not very tolerant to pollution, including soil acidification and acid rain (this is mainly caused by automobiles). While they were once found in parks throughout the USA, with the rise of the automobile, these trees had a harder time surviving in urban areas. Culpepper goes as far to call this tree a “gentleman’s tree” as it was often found in urban parks. 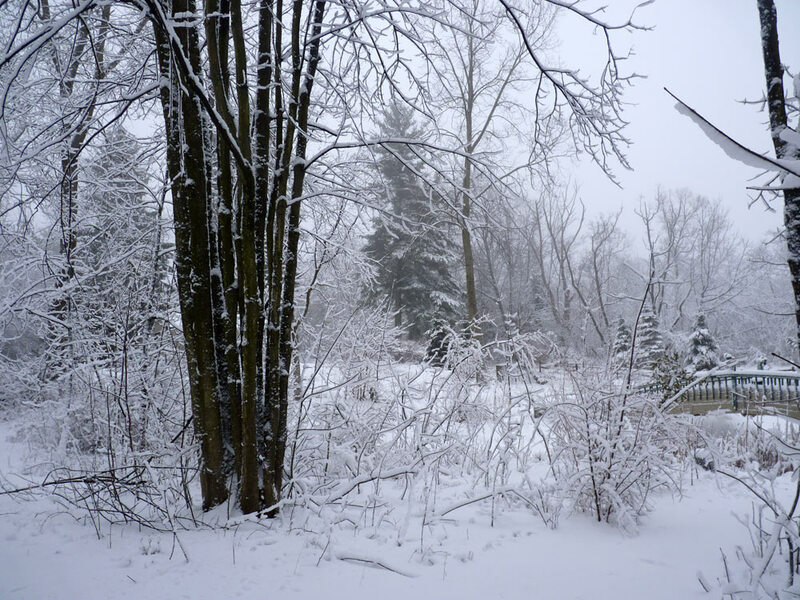 The salt from roads also damages the tree’s root systems, contributing to its decline. This is not to say that the sugar maple is still not a dominant tree-it is. You just need to get off the roads and out of the cities to see them. The sugar maple’s decline in 21st century USA is a terrible shame because the sugar maple is one of the gems of our woodland tree species. Perhaps this tree is best known for its sweet sap, which can be boiled down to make maple syrup or further boiled to make maple sugar (a process I detailed last year). This process requires 40 gallons of maple sap to produce 1 gallon of maple syrup–certainly, as the native American legends describe below–the maple teaches us that hard work reaps just rewards. I also have made a sacred trees brew with maple, hickory, white pine, and birch. Its a fabulous drink, and brings in the sacred blessings of these trees. Pemmican was made by pounding strips of meat and berries with maple sugar and letting those dry out in the sun (Iroquios, The Hunting of the Great Bear). Pemmican was an incredibly important food for native peoples and American colonists alike, especially those in the frontier areas of the USA. 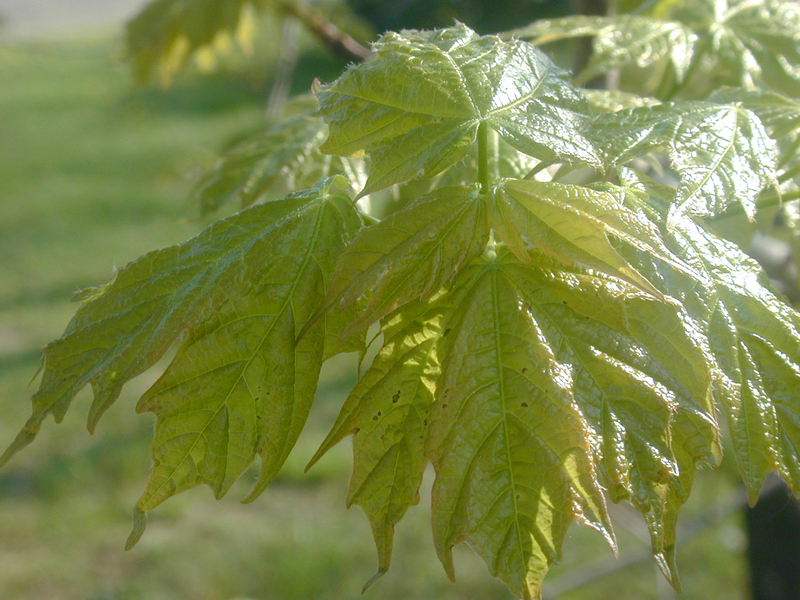 Finally, maple leaves are edible, and they are actually pretty tasty in early spring. I like them in salads or as a little snack. Maple wood is often used for furniture and flooring. It has a beautiful light color and I have found it nice to work with for carving and natural building. As I learned in a recent round pole framing workshop at the Strawbale Studio, bark from maple poles freshly cut just comes off like butter with a simple draw knife! If I ever get to build my own cob house, I hope to use maple for the rafters! It is also often used for making instruments (I have a beautiful panflute made of maple). The Pennsylvania Dutch used the inner bark of the red maple (acer rubrum) boiled in water for dying flax or wool (they combined it with copper for staying power). This produced a lovely purple–I haven’t tried this myself yet, but its certainly on my “to learn” list! The Native Americans also used maple to make aprons or bows. Women used maple to make aprons, and at least in one story, painted those aprons red. Culpeper’s coverage of the maple tree suggests that the maple strengthens the liver and opens obstructions of the liver and spleen. Hagender’s coverage of the maple suggests that the Chippewa used a decoction of the bark to treat sores, the Mohegan to cure coughs, and the Tsalagi used the silver maple bark for sore eyes, cramps, and other gynecological problems. There really isn’t a lot of coverage about the maple in most modern herbals, which is pretty surprising. In order to understand the sugar maple in the Native American lore, I reviewed numerous legends–the sugar maple features prominently in their tales. The maple as a gift that takes work. The maple was one of the only sources of sugar for the native peoples–as such it was seen as a gift from the creator. While the maple is a gift, the native tales are clear that this gift takes work (in the form of collecting sap and boiling it down to make sugars). In Gluskabe Changes Maple Syrup, the Creator had originally had sap flow from maple trees as rich and as thick as honey–one needed only to break off a branch and the sap would flow out at any point of the year. However, Gluskabe, who’s job it is to report back to the Creator, comes across a group of people who were fat and lazy, who abandoned their village and instead laid down in a maple grove sipping sap all day. Gluskabe was instructed to fill the maple trees with water each day for a full moon cycle, and now, people would have to work to have the sweetness of the maple and they would only have it for a short time in the spring to learn the error of their ways. At the end of the story, the people worked to turn the sap into sugar by burning cedar and making white birch buckets (using the magic of those two trees as well). The work of the maple sugar is also found in the Senaca legend, Woman who Fell From the Sky, where the maple sap is changed to keep people from living too easy. In another legend, The Sugar Maple, the Sugar maple gets help from Woodpecker, who helps him by pulling out the grubs that are under maple’s bark. Later, Woodpecker is dying of thirst during a drought, and Maple allows him to drink by pecking holes in the tree. Maple as a delicacy. Maple sugar was seen as a delicacy by the Native Americans. In several tales, babies appear sucking maple sugar. In other tales, it is prepared as a drink with herbs. In one Ojibwa legend, a maple syrup feast is mentioned. Honoring the maple tree in ritual. In order to keep the maples producing the sap, Native Americans did maple ceremonies to ensure good sap harvests each year. These were typically done right as the sap began to flow from the trees. These ceremonies usually involved having everyone gather around the tree, addressing the tree in ritual language, and offering the tree tobacco incense. This reminds me quite a bit of apple orchard wassailing. Maple as a gentle tree. When talking sticks are made out of maple, it is said to represent gentleness. The Fiery Red Leaves of Maple represent blood. The reason that maples turn red in the fall can be explained by Chasing the Bear, where a long bear hunt ends with the hunters piling up sumac and maple branches and butchering the bear upon the branches. In another version of this legend, “Hunting the Great Bear” reported by Hageneder, the long bear hunt happens each year. The the four brothers (who make up the constellation of the great bear) finally kill the bear and the bear’s blood falls down from the sky and turns the maples red. The maple tree is ruled by Jupiter (Culpeper). Hopman suggests that maple is used for love and wands, its also often used as a handfasting herb. Again, I found very little in the western esoteric traditions, and what I did find, I’m not sure of its source. I do think that the native American legends provide us with some wonderful information about the maple, however. With her running sap, her gentle presence to her striking bright reds, yellows, oranges, and purples, I truly believe the Maple tree is a gift from the land. Her sap typically runs between Imboc and Alban Eiler (spring equinox) and her leaves brighten between Alban Alfed (fall equinox) and fall by Samhuinn. I think the fact that the two more prominent events of the Maple occur around the equinoxes is no coincidence, for I have always seen the maple is a tree of balance, a tree that sits between the worlds. Maple as a tree of gentleness and yet as a door opener. has always resonated with me. Meditating near a maple often leads one on unexpected journeys on the inner landscape. Sometimes, as I sit by an old maple tree, the tree tells me her story and I listen and learn. When I was a child, sugar maple was one of my favorite friends. With her smooth, light gray bark, and evenly distributed branches, she made a perfect tree for climbing. From the canopy above, I would hide in her embrace, looking out at the world below. I would spend hours in one particular maple tree, sitting on a long, outstretched limb and observing the world around me. Inch worms lived in the tree, and once in a while, a bird might land. The sugar maple tree has always felt very protective and nurturing. I hope that you find a chance to have your life enriched by the blessed sugar maple tree!